Above & Below: Electrick, a blue to green foil finish shade shown in it's "normal state" above, and below outside in partial sun. The brush strokes were minimal, which is unusual for a foil finish, but definitely a good thing. I think this would be an interesting one to use as a Konad stamping color, and the color-change effect would be an added bonus. Below: Electrick in full sun after about 30-45 seconds in the sun. Below: Ruby Slipper in it's "normal state" is a fairly sheer silver glitter shade. I also used a coat as a top coat over Misa's Can't Nobody Take Me Down to see how that would work. Below: Ruby Slipper shown outdoors in full sunlight. This one is a silver glitter to a deep rose glitter shade. The ring finger where I used a coat as a top coat didn't change the base color, but the glitter does change color. Below: Ruby Slipper shown in the shade about 1 minute after being in the full sun. Below: Peek-A-Boo is not to my liking, simpy because I enjoy more color on my nail. In it's "normal" state it is little more than a clear polish. Below: Here is Peek-A-Boo outdoors in the shade and you can see the pink coming through. Below: Fully processed in the sun, Peek-A-Boo is a sheer red veil of color. I am having too much fun with these polishes! I have to move quickly because they change color very fast once outside in the sun, so I tried to take several pictures of each one ranging from indoors to outdoors. I used 2 or 3 coats on all of these, depending on how well they covered after each coat, but the drying time is quick. I also put a clear top coat on a couple of nails to see if that would weaken the color-changing ability, and it did not seem to alter it at all. The mission statement for Del Sol is "Create Fun, Joy, Smiles and Memories for Everyone under the Sun! ", and I am definitely having some fun under the sun with these polishes. The quality of the formula is nicer than I expected, in that it applies smoothly, dries quickly, and the brush is cut well. I don't have any complaints about these, other than the fact that Peek-A-Boo is not really a shade I am crazy about, but that's just a personal preference. Here are a few more interesting facts about Del Sol that I thought you might enjoy...they sold 508,136 bottles of nail polish this post year and with the growth they're experiencing, I'm sure that will continue to increase. They printed 1.5 million shirts in 2008, using 1,213 gallons of their organically-made Spectrachrome® ink. Spectrachrome® is their "secret" ingredient found in all of their products, including their nail polish, which causes them to change color. Del Sol’s exclusive Spectrachrome® crystals open and unfold upon exposure to sunlight, revealing their hidden colors. Del Sol’s special formula for color-change technology was developed from a concept originally explored by NASA. After years of research, Del Sol has made revolutionary enhancements to the color-changing technology by engineering its proprietary Spectrachrome® Crystal Dye, which is identified as the most vibrant color-change technology on the planet. Their products all have a 100% money-back WOW Guarantee, which promises that their products will make you say, “Wow”, and the color-change vibrancy will last for the life of the product. I've got 3 more shades to share with you coming up later today, and I'll also tell you about some of their community involvement, which is a big part of their mission. It's always nice to know that a company can make a great product and give a little something back to those in need. If you missed my first post earlier today, you can scroll down and see bottle pictures as well as additional information on this product, including a coupon code. *Sponsored review, products furnished by Del Sol. I think I see some 3-free indications on one picture. Do you have an ingredients list? This is so amazing! I've never seen any nail polish like this before! What delightfully pretty shades of polish - I'm hard pressed to pick a favourite! I'd never heard of this brand before (such a cool idea), but will keep my eyes peeled for it now. Thank you for sharing all these wonderful shades with us! I lovelovelove color changing polishes! I am definitely gonna look into ordering some of these! I love Girls Night Out. I have one, but I don't wear it much, because the purple is kind of too much, but this purple is like OPI Catherine the Grape, one of my favorites. amusedPolish~they are lots of fun! Hopefully, you can locate them. Kira~I do and if you E-Mail me your address I'll be happy to send them along. Too long to post here! Skye~glad you like them. I was amazed at how drastically the color changed. Kae~aren't they cool?!! I like Ruby Slipper too. Jin~I have some Toma's and Nubar's that change, but not to this degree, so I'm pleased with them. Jessica~thank you! They're good quality too, which makes them even nicer. Hope you find some. ~Lisa~I agree, that one is beautiful outdoors! Danica~I was really impressed with this one. The purple didn't seem "too" much to me and I love the gold shimmer. 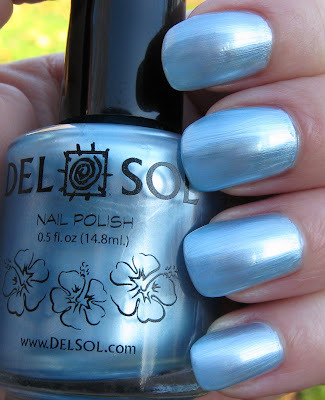 I've seen some swatches of Del Sols til now, but your swatches are always the neatest and they look soooo gorgeous!